I love Gloom. Not only because I have an unsettling interest in the morbid and gruesome, but because it’s so much fun to play. I don’t have experience of card games on the whole; the best I could do is fluke a game of snap. So my relief was overflowing when I was introduced to Gloom. Rules wise, it’s simple. There are 4 families to choose from, each with different characters. Once you all have chosen your favourites, separate cards are dealt to each person. 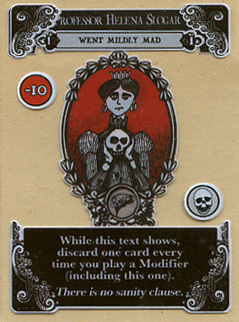 Minus the character cards, there are Event cards (which, obviously, list an event which could be happy or sad), Modifiers (which add or subtract points, depending on the card) and Untimely Death cards (once you’ve made a family member suffer so much and you feel merciful, you can make them kick the bucket). The object of the game is to make your own characters suffer greatly, while making other players characters enjoy themselves. The real fun comes from explaining how each of your characters came to every misfortune. My sides have split on numerous occasions whilst hearing how ‘The Old Dam’ was so scrawny and tall she was ‘mocked by midgets’, and was so depressed from the death of her husband that she was ‘Driven to Drink’. Oh, did I mention the husband died because he was ‘Terrified by Topiary’? 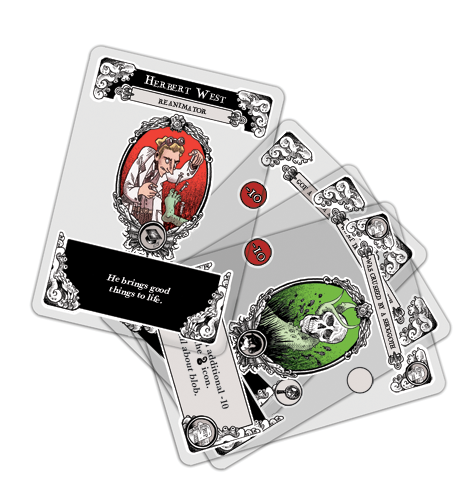 The random events listed on the cards serve to fuel your imagination, leading you to accept your inner storyteller, and entertain each other for hours. A game is over only when one of the player’s families has bitten the dust. How long it takes you to get there is down to the players. There can be some tactics involved; if you don’t keep an eye on the game, you could find your characters coming into some money, or getting happily married. And that would be terrible! On an aesthetic note, the design of the cards is strikingly clever. 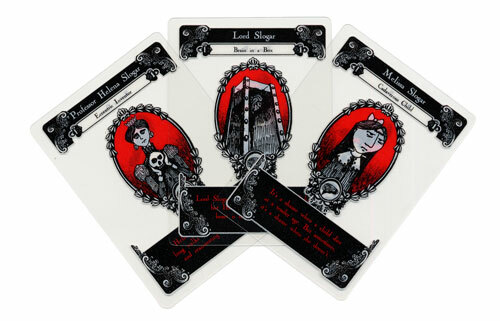 The cards are transparent, allowing them to be placed on top of the family members portraits. It’s wonderful not having to keep lifting the cards up to have to see who you’re trying to screw over. There’s also the fun element of turning over the portrait once a character dies, to reveal a skull being picked at by a raven. You come to celebrate this event, and relish in the fallen character. To an extent, you dance on their graves. (Something you could never do in reality). All in all, Gloom encourages us to embrace the disastrous and celebrate the sorrow. 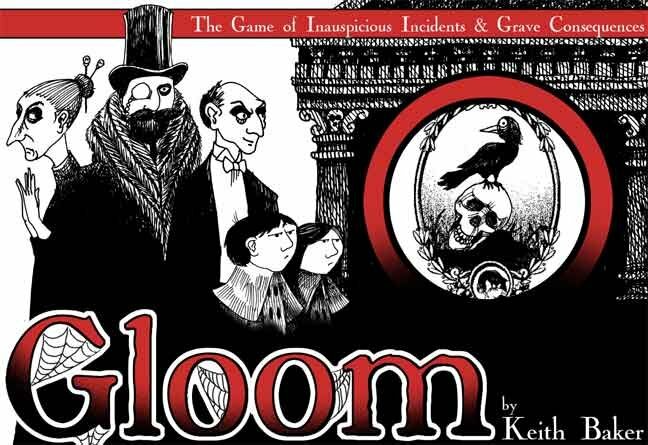 For those who are new to gaming as a culture, Gloom can be considered as pricey, but when compared to other card games on the market, it’s well worth the investment. So, I say bring on the Gloom!